Throughout history, humankind has been associated with gardens. Many faiths hold the belief that human life began in a garden. The first designed gardens date back to 2000 BC in Mesopotamia, where lush gardens were planted in this arid region. In the 1100's AD, the therapeutic benefits of gardening were first described in a hospice garden located at a monastery in Clairvaux, France. In the United States, Dr. Benjamin Rush, University of Pennsylvania professor of the Institute of Medicine and Clinical Practice, published findings in 1812 that patients who worked in gardens had better recovery rates from mania compared to those who had not had the same gardening experience. In 1879, the Friends Hospital in Philadelphia, PA was the first American hospital to build a greenhouse to be used for patient rehabilitation. When injured WWII veterans were admitted to Veterans Administration hospitals, physicians used on-site gardens, donated and planted by garden clubs and horticultural businesses, specifically for rehabilitation therapies. 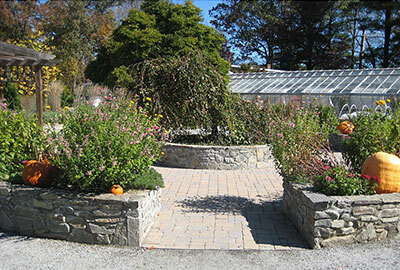 Today, gardening is used in hospitals, recovery and rehabilitation centers, senior centers, public and private schools, rehabilitative programs, and correctional facilities, all with the goal of providing people living with physical, mental or social limitations full and unobstructed access to therapeutic gardening activities. The professional field of Horticultural Therapy (HT) began in 1973. The American Horticultural Therapy Association defines HT as "the engagement of a client in horticultural activities facilitated by a trained therapist to achieve specific and documented treatment goals." One important application of horticultural therapy treatment is the design and use of enabling gardens. People who experience a temporary or permanent setback or disability know how important it becomes to navigate or adapt to the limitation in activities of their daily living. Regaining their sense of independence and capabilities, through the use of assistive equipment, therapies, and remodeling living areas, they manage to adapt out of necessity to overcome barriers and find easier ways to continue to do things they enjoy or need to accomplish. With a similar approach, gardens can be designed for both therapeutic and enabling efforts. Enabling Gardens provide horticultural experiences for people of all ages and abilities. This garden features an accessible path and perennial plants that offer sensory stimulations such as colors, textures and fragrances. Bullington Learning Center, Hendersonville, NC. Photo: Laura DePrado. Gardens can be created to invite spontaneous play, exploration, discovery, and interaction for various audiences. These natural settings can also help to reduce stress and allow for a restorative experience, as research has demonstrated. There are benefits for everyone. Permanent and temporary gardens can be constructed with simple or expensive materials. Gardens that are used by multiple populations need to have varied structures and mini-settings to accommodate different user groups. 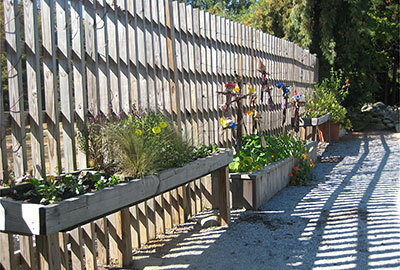 Enabling Gardens allow participants of all ages and abilities to fully participate and enjoy the gardening experience. They are designed to be barrier-free and to provide sensory stimulation and physical activities in a non-threatening environment. Terms such as ‘barrier-free' and ‘non-threatening' take on a new meaning when dealing with a loss of ability or agility, and should be fully researched when considering the audience, visitors, and gardeners. The garden could be located indoors or outdoors. It could offer seasonal or year-round activities. The garden could be as simple as a single raised planter bringing the ‘ground' up to a more workable height to a much more intricately designed space filled with pathways, textures, scents, and sounds. There is a wide diversity of materials to consider for garden pathways, containers and planting beds, and garden structures. Much depends on who will be using the garden and what the limitations or challenges are for that population. Wheelchair users need surfaces that are smooth, level and firm. Children need small-scale settings with opportunities for surprise and discovery. Alzheimer's patients need settings designed for safety and a sense of security, while still connecting the participants to nature. Gardens can start as a small-scale project that may transition to a much larger effort requiring an overall master plan to continue expansion and seek new audiences. Large scale projects benefit from the services of a professional landscape architect, as they may be more familiar with local construction codes, design principles and plant material. Bid specifications for qualified contractors require professionally prepared blueprints. Enabling gardens of all sizes benefit from the expertise of a horticultural therapist during planning so that the maximum benefits can be realized. There needs to be a sense of ownership and commitment by either the individual caring for a small container garden or by an agency hosting a larger gardening project. No matter the size, the success and sustainability of these gardens requires maintenance, programming, and funding. 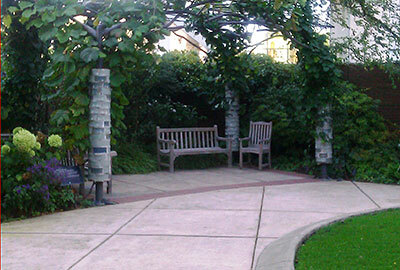 Healing garden at Legacy Emanuel Medical Center, Portland, Oregon features wide circular pathway with focal point such as the pergola to help patients, staff, and visitors walk or wheel through the gardens and feel well-oriented with their surroundings. The pergola offers a place of shade, a place to rest, and a place to view and connect with surroundings. Photo: Laura DePrado. The entrance to an enabling garden should be close to a handicapped accessible parking lot, specifically for participants who may have mobility issues. A level walkway to the garden is preferred. Slopes greater then 5% (a one foot change in elevation per 20 feet of walkway) are difficult to maneuver with a cane, walker or wheelchair. Avoid locating the garden where stairs are needed to enter the garden. If stairs or steep slopes are not avoidable, wider stairs with lower risers and handrails should be provided. Ramps should be added if possible. Wide pathways made of light colored level surfaces provide easy access throughout the garden. The materials selected for a pathway should drain well and have a texture to avoid creating a slippery surface when wet. The path should be at least wide enough for a wheelchair to make a complete turning radius. This width will vary depending on the models of wheelchairs used by present and future gardeners. Generally, a five foot width will allow for a 180° turn or two people to walk together. A six to seven foot width allows two wheelchairs to pass. The final determination of width ultimately depends on the wheelchair models and budget considerations. The path should be designed in a circuitous or even circular fashion so visitors will come back to the same starting point. The garden cannot have any obstructions to mobility, and should provide a sense of place and orientation. A reference point could be a pergola, a water feature, wind chimes or a seating area. This design aspect is very helpful to people who may have a visual or memory impairment. For outdoor gardens, comfort and safety for clients is a primary concern. Some people may be on medications that increase sensitivity to sun exposure. If the garden is being used for sun-loving plants, such as certain vegetables, shade can be provided with umbrellas or garden structures such as gazebos or pergolas. Seating in shady spots is an important design feature, and people should be encouraged to linger. Add water features and wind chimes for peaceful and pleasant sounds. Heavily shaded areas and dark colored pavement may create the perception of a hole in the ground for some participants. Use light-colored materials with reduced glare whenever possible and consider supplemental lighting. Plant selections should be made according to the needs of the users: shade, seasonal interest (flowers, fall color), songbirds, butterflies, etc. Whenever possible the clients should be included in the selection process (e.g., annuals and vegetables) to foster a sense of ownership. It is appropriate to have a wide variety of plants for optimal sensory stimulation. Visually impaired clients who cannot appreciate the color of a bloom will enjoy smelling mint or rosemary and touching plants with unique textures, like Lamb's Ears and succulents. This Enabling Garden is surrounded by a chain link fence. Inside the garden, a wooden lattice provides dappling shade. Note the table beds can be reached by a person in a wheelchair. The center raised bed is a good height to pull a wheelchair alongside or for a child to reach into to plant or smell a flower. The Bullington Learning Center in Hendersonville, NC. Tables create a workspace for gardeners to perform tasks such as potting up plants or pruning. Open areas beneath tables can be designed to accommodate the knees of wheelchair users, walkers with seats and other mobility devices. Lower heights can accommodate younger gardeners. Raised bed planters of various materials, designs, heights, widths and lengths can be placed temporarily or permanently throughout the garden space. Planters also provide an area of support and place to lean or take rests. Vertical gardens could feature climbing vines and containers on cables and pulleys for ease of maintenance and seasonal replanting. Raised walls also offer the opportunity for sitting, resting and passive watchfulness and participation in the garden. Raising the soil level three feet is a good height for both adult wheelchair users and standing gardeners. Extension handled tools can enable individuals to participate from the seated position. Having accessible storage space for placement of tools, supplies, workshop and educational materials is ideal. Storage areas can be designed to also serve as activity/work areas. All gardening implements (tools, watering cans etc.) should be light weight, brightly colored, inter-changeable, and adjustable to be used by multiple audiences with a wide range of abilities. They should be safely and easily stored by participants in the storage area. 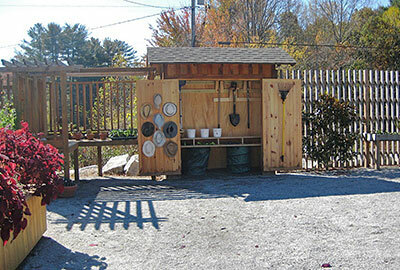 This storage area at the Bullington Learning Center in Hendersonville, NC has a workspace and easy access to tools. Photo: Laura DePrado. Enabling gardens should provide security for clients and plantings, too. Fencing of various designs and walls made of natural materials can offer security from theft and safety for participants, while at the same time offering space for hanging planters and vertical planting. Access to utilities such as water and electricity are key to a successful, well maintained site. Handicapped accessible bathrooms should be available for participants within a reasonable distance from the garden. Electricity may be needed for lighting, water features, and the use of small power tools by some clientele. Water for maintaining plants, cleaning hands, and drinking must be easy to obtain. Hose spigots should be two to three feet above the ground for ease of access by individuals using a wheelchair. Lever faucet handles are preferred over knob handles as they are easier to turn on and off. American Horticultural Therapy Association Definitions and Position Paper available at: ahta.org. Rothert, Gene (1994) The Enabling Garden Creating Barrier-Free Gardens. Taylor Publishing Company, Dallas TX. Adil, Janeen R. (1994) Accessible Gardening for People with Disabilities A Guide to Methods, Tools and Plants. Woodbine House, Bethesda, MD.